Phosphorous is a naturally occurring element that is required by all plants, including those used to produce food and fiber for human consumption. However, when it is present in natural waterways in excessive amounts it can pose a significant pollution concern. Sugar beet growers at SMBSC have developed an innovative cover crop program to keep as much of this valuable resource in their fields as possible while minimizing the potential of phosphorous causing pollution concerns downstream. Pollutant offsetting provisions of the NPDES/SDS permit is a pioneering solution that reduces phosphorus pollution in the Minnesota River watershed. 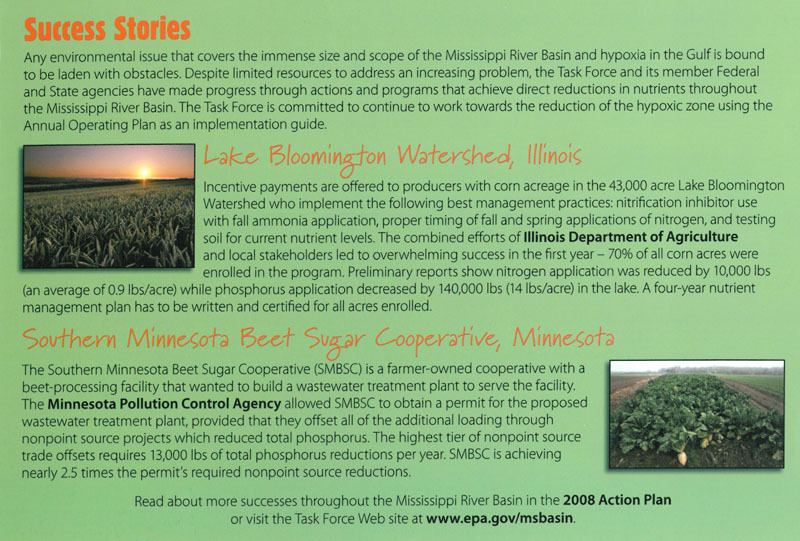 Under the offsetting program, SMBSC has facilitated the reduction of 150,000 pounds of phosphorus into the Minnesota River Watershed by creating incentives for farmers and cattle ranchers. Each year SMBSC funds projects that protect and improve water quality, like phosphorus retaining cover crops, drain tile screens and fencing to keep animal waste and activity from streams. The MPCA reviews and certifies the projects to determine the total amount of phosphorus pollution that has been averted. SMBSC’s efforts and successes in reducing phosphorus pollution have been recognized by Citizens United for River Environment, C.U.R.E. a citizens group working to maintain and restore river health in Minnesota. The United States Environmental Protection Agency has also referred to SMBSC’s efforts in phosphorus reduction as an example for others to follow (see below). At SMBSC the concept of sustainability has been in practice for quite some time. Copyright © 2013-2019 SMBSC. All Rights Reserved.